From the beginning, when we decided that we wanted to make Roppongi Hills a model for future developments in urban planning, we decided to create a new museum where the best in contemporary art and architecture would be shown. The Museum opened in October 2003 at the top of the central Mori Tower - a place visible from throughout Tokyo. The Mori Art Museum strives to be a place for enjoyment, stimulation and discussion - a place where what is important in our culture and society is openly debated, not only through the exhibitions that are shown there but also through a wide range of Learning programs. It engages an audience ranging from young school children to students and senior citizens, from people living in the local community to the whole region and around the world. Our location in Japan and East Asia is important and we consider it one of our missions to become a platform for artists from this region. 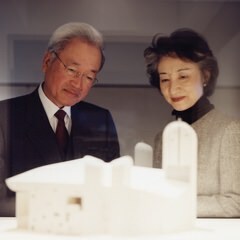 Since opening the Museum has received high critical acclaim for its wide variety of original exhibitions, many of which have been organized around universal themes. We look forward to continuing this work, and meditating between the best art of our times and Tokyo’s many residents and visitors.